Aluminum Lock Nuts combine the utility of lock nuts with the economy of aluminum. 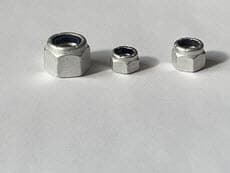 KD Fasteners aluminum locknuts are made to resist loosening under vibrations and torque. The aluminum gives the lock nut a good strength-to-weight ratio, low density and corrosion resistance. Aluminum lock nuts are also easy to clean and require almost no maintenance. KD Fasteners Inc.’s aluminum locknuts are made in America. Contact us today by calling 1-800-736-5014 or filling out our contact form. Corrosion resistant, lightweight and durable. The T6 designation indicates that the metal is heat treated and artificially aged. Aluminum 7075 is solution heat-treated and artificially aged until it meets standard mechanical property requirements.